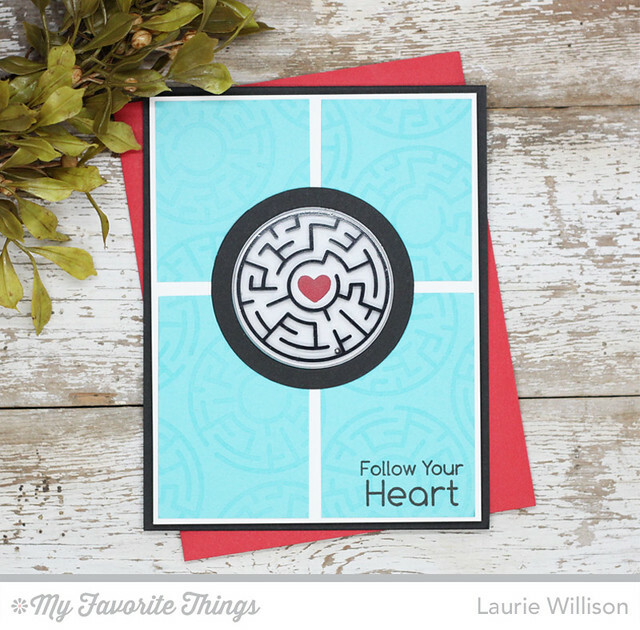 I love how you chose a color block design as a background for your maze, Laurie! Lovely tone-on-tone stamping, too! Really cute card! A great background to showcase the maze Laurie. Well done. Like the background - simple but very cute! Great use of colors . Love the simple design! This is really cool! I love the black maze. I like the use of circles and squares. Absolutely love this card - the design, the colors! Ooooh, Aaafahhh, I LOVE the background and the whole idea of the card!! The quadrant background paper highlights the maze theme so well. The single heart in the center of the maze is perfect for this sentiment. Thanks for sharing it. Love your simplicity and color choices!!!! Cute ideas! I especially love the blue/black/red combo!